Edward E. Taylor, age 74, of Albion, Pa, died unexpectedly on Monday, November 19, 2018 at St. Vincent Health Center, Erie, PA.
Edward was born in Erie, Pa on September 30, 1944, the son of the late Robert and Marie (Matthews) Taylor. 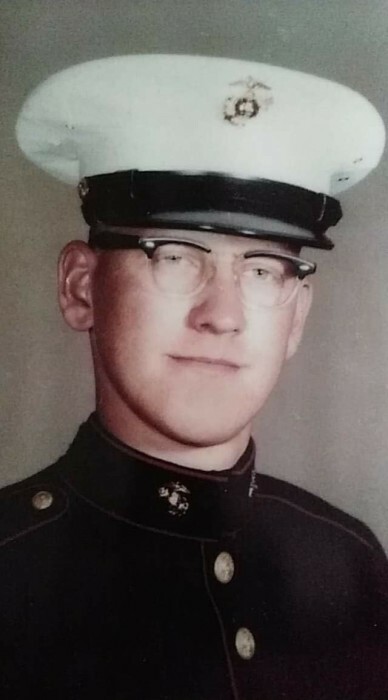 He proudly served our country in the United States Marine Corps during the Vietnam War and was a member of the Girard American Legion. He retired from the Copes Vulcan Corp. in Lake City where he worked for many years as a CNC Operator. In his spare time, he enjoyed woodworking, and gun collecting. Besides his parents, Edward was preceded in death by a daughter, Cindy Adams. He is survived by his wife, Rose (Harrison) Taylor and four daughters: Debra Hodge Boyer (Barry) of Erie, Brenda Hall (John) of East Springfield, Pam Mead (Denny) of Lake City, and Shelly Biles (Gary) of Springboro; and two sons: Bobby Gariepy (Rhonda) and Roger Gariepy (Jen). Edward was also survived by three brothers: Roger (Linda), Bobby (Sue) of Conneaut, and Roy (Pam) Taylor of Girard. There are 18 Grandchildren and 24 Great-Grandchildren that also survive Edward that will miss him deeply.